“If I could speak to myself back when we launched as a hospitality business, in 2014, I’d say: ‘Go in positively, it can be done!’,” says Rebecca. Any initial caution however is entirely understandable, as the family privately financed the development of the restaurant and four luxury bedrooms in the main farmhouse. 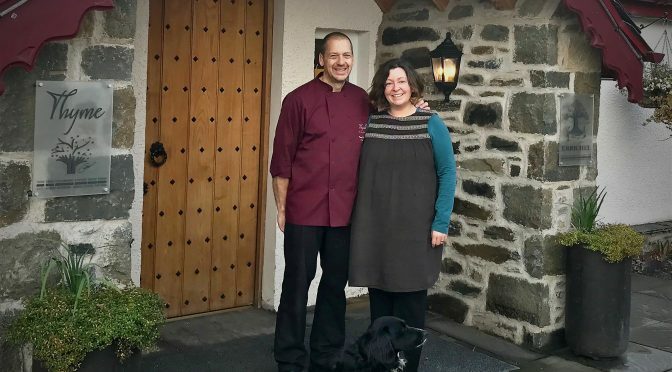 Jump forward four years and Thyme at Errichel is now a Scottish Food & Drink Award winner 2018, and the business won the tourism category in the inaugural Helping it Happen awards, run by Scottish Land & Estates. “That was a pivotal moment,” says Rebecca. The couple now breed both Shetland cows and Shetland sheep, both rare breeds well suited to living on the hillside terrain; they keep pigs, geese and poultry; and offer luxury accommodation as well as an award-winning dining experience. With the diversity on offer, Rebecca admits; “we’re still finding our way with the marketing mix”. Following business development missions to Italy, The Netherlands and Germany with VisitScotland in 2017, this year saw them welcome many more European visitors, especially from Germany, plus an increased number of guests from the USA and Canada. “Locally, farmers markets and opportunities for Paul to do cookery demonstrations are effective ways to promote our focus, and a PR campaign over the summer has seen an increase in bookings. While our rooms in Errichel House appeal to couples, our cottages are ideal for families and groups of friends, what all our guests have in common is a love of the countryside, the environment, creature comforts and great food. “Across all our marketing efforts, we remain true to the soul of the farm as a family business. It is vital to really understand who you’re targeting, as that flows through to everything else, including pricing. People now treat Errichel as a destination in its own right, and book with us because of the restaurant, which is great.